One of the double-plus benefits of living at Chez Woody is the six-pack bottle shop out my back door & across a short parking lot. I like to go in & browse, shoot the breeze with my neighbors & generally keep my hand in. Occasionally, something will just jump out at me, like tonight, when I spied a rack (sixer) of these sitting on the room temperature shelf. My neighbor was equally baffled and discounted the price since they were not cold. I love my house, my neighborhood & my neighbors! From the bottle: "Brewed in Munich Germany since 1397". Once the cap was Pop!ped, I employed an aggro pour that produced a finger-plus of rich, thick, deep-tan/light-brown head with good retention. Color was Brown to Dark Brown (SRM = > 22, < 27) with NE-quality clarity. Nose had a treacle-like sweetness and it reminded me, just as Cuz Colby did last night, that I really need to read my copy of "Malt". Is this melanoidin? I don't know, but I am interested. Mouthfeel was medium. The taste was nutty, bready, treacle-like and very drinkable. The finish was semi-sweet, making it all the more enjoyable. I can go for years without sweet stuff and this was only slightly sweet, just enough to be enjoyable without doing me in. I am gifting the remaining five to my tasting club tomorrow, so it will be interesting to see what they think. The beer poured a deep garnet color, with a minimal cream colored head. The head faded after a minute into a ring of foam around the edge of the glass. Bits of lacing seen as the beer was consumed. The aroma was a clean, bread and caramel affair. A slight toasted malt was noticed. The taste followed suit, clean and simple. Sweet malts, caramel, and a balancing bitterness. A tasty dark lager. The beer had a decent carbonation and feel. A decent beer overall. Fairly easy to drink. I'd probably have it again. Poured from a bottle into a seidel. Transcribed from notes. A: Dark ruby-brown body with lots of bubbles coming up from the bottom. Thin off-white head that eventually disappears. S: Lots of yeast and malt with a faint whiff of dark fruit and caramel. T: Bready with some chewy caramel malt. M: Medium bodied, a bit sticky sweet at the end. I went to my favorite beer bar and they just got this one in. I had to try it. A- Poured a deep red brown color with a creamy tan head with a little bit of lacing. S- Strong nutty and malted caramel aroma. Maybe a little bit of fig. T- Lots of malted flavor with some coffee and and hazelnut taste. M- Smooth and creamy, not too dry. Lacking a bit on carbonation though. D- Overall a pretty nice beer with a distinct taste. Worth trying. Pours a clear, brown copper color with a two and a finger head. Herbal hops with grainy Munich malt notes. Malty with a hint of roast and herbal hops on the finish. Light side of medium bodied with moderate carbonation a light dryness on the finish. Very drinkable and I wouldn't mind having a few more of these right now. pours a deep bourbon amber with little to no lacing and an off-white head. smell is a deep sweet roasted toasty sour dark dried fruit marinated in molasses. something like that which translates more subtly in the flavor...mouthfeel is a bit thin, but crisp enough. dry, but finish lingers a bit. carbonation actually a bit over the top is a good thing here. the flavor could be so more rich if the mouthfeel was thicker, but it works in a refreshing way as it is. 'good'...which makes this pretty much a delicious though not as complex as i'd like brew. sure it would work with food, but pleasant enough to enjoy a few rounds. not a go to. but at its price, quite tasty when compared to almost every american macrobrew. there's something admirable here. and somewhat disappointing. edit: revisited this today on this second record breaking day of east coast heat....5:30pm and it's still 100 degrees! so, this being a very cold brew hits the spot...and some of the above 'criticisms' work to be highlights now...GLAD it isn't thick and overbearing and subtle...very refreshing...actually, the flavor profile is much more pronounced than the day i tried it first in april...my tongue seems to change with the seasons. so, i bumped up a few points to balance these two samplings. 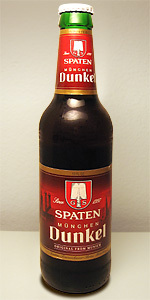 D- Could have a few of these- nothing amazing considering how much I like Spaten Oktoberfest and Opitimator. I will stick with those two for now.